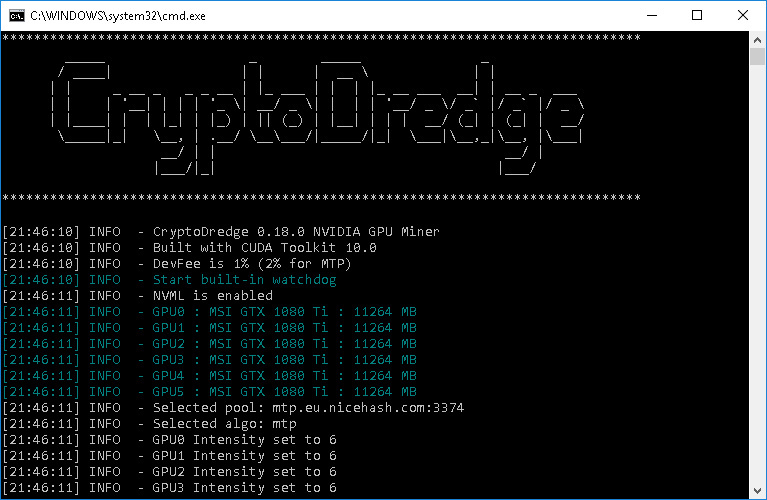 It has been a while since the last release CryptoDredge 0.17.0 was made available to Nvidia GPU miners, but here comes the new CryptoDredge 0.18.0 and it brings some new and useful features on the table. The new version brings support for the Argon2d algorithm (argon2d-dyn only) as well as the much anticipated support for MTP and Cuckaroo29 on NiceHash. Prior to that the only MTP miner with NiceHash support was TT-Miner and currently MTP is among the most profitable algorithms for Nvidia GPUs on the service. The new CryptoDredge v0.18.0 also makes API more compatible with ccminer API, adds support for mining Aeternity on GPUs with 2 GB of memory (Linux only) as well as introduces support for mining Cuckaroo29 on GPUs with 4 GB of memory (Linux only) and for windows users it indicates activity to suppress auto sleep mode. Do note that the CryptoDredge miner supports only Nvidia GPUs and is a closed source software that comes with 1% built-in developer fee for all supported algorithms, however the dev fee is 2% currently only for MTP mining (Zcoin), there are binaries available for both Windows and Linux (CUDA 9.1/9.2/10.0).